Echjay Forgings Pvt. Ltd. was founded in 1960 as a family-owned company. 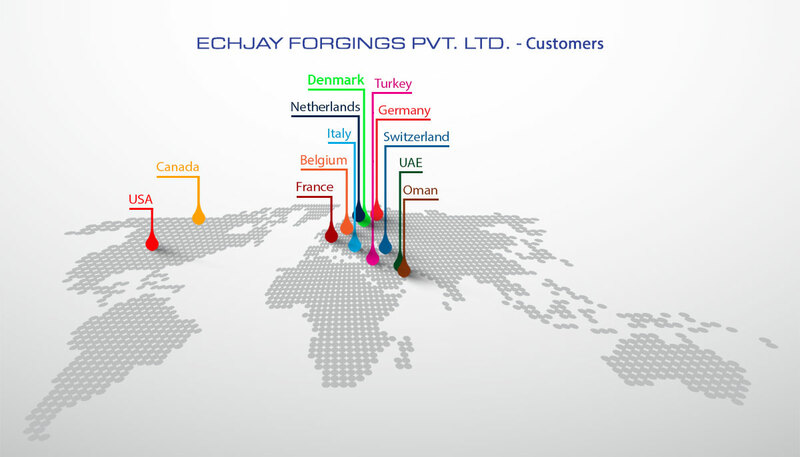 A pioneer of forgings in India, Echjay has steadily expanded since then to become a world-class manufacturer of forgings, flanges and rings to customers all over the world. With over half a century of experience, the ‘Echjay’ name is synonymous with Quality, Commitment and Integrity. Today, Echjay boasts an integrated setup from ‘design-to-delivery’, and has an array of equipment forging including a Thyssen-Wagner Ring Rolling Mill and a comprehensive CNC and VMC shop as well as a fully-equipped laboratory. Echjay’s dedicated team has a customer-centric approach coupled with cost-efficient design and manufacturing, and caters to various sectors of industry including Oil and Gas, Petrochem, Automotive, Defence, Railways, Aerospace and General and Heavy Engineering. Echjay’s policies showcase the management’s high standards of ethics and commitment to fair trade practices, human rights (including adherence to Indian Anti Child Labour Laws), environmental preservation and sustainability. Echjay has a capacity to manufacture 30,000 Tons in a variety of drop-forged, open-forged, hollow-forged, extruded, machined and assembled components in carbon, alloy, stainless, aluminium, duplex and super duplex steels. All Right Reserved © 2019 Echjay Forgings Pvt. Ltd.